I can't help, but I love those early C-man tools. BTW, what was it that drove the bids through the stratosphere? BBTW, does anyone know what sizes make up a 1/2" Plomb deep socket set? I must be getting fairly close. The Plomb deeps go from 1/2” through 1-1/8” plus one 8 point 7/8” socket. On your Snap-on ratchets the date codes are between the On and Off under the selector levers. The G code is 1945 and the Circle with the line through it is 1940. On the Wright Field ratchet Plomb didn’t use date codes but they were likely made from 1941 to 1945. Recent purchase. The driver set is Allied International made in Japan. The push drill is a Stanley 41Y. The 8 inch adjustable is a Fuller made in Japan. The 10 adjustable is a very recent Chinese tool. The needle nose pliers are West German and the chisel is Stanley ovoid handle with slight depression on each side. The design of the handle is patented. It looks to me like your 1/2” drive ratchet was made in 1945 and your Ferret was made in 1940. Thanks for the dates d42jeep. I didn't realise it was possible to date these things. Dad would have been 17 in 1940 so I rather expect he acquired these ratchets (and a number of sockets) some time later, probably second-hand. 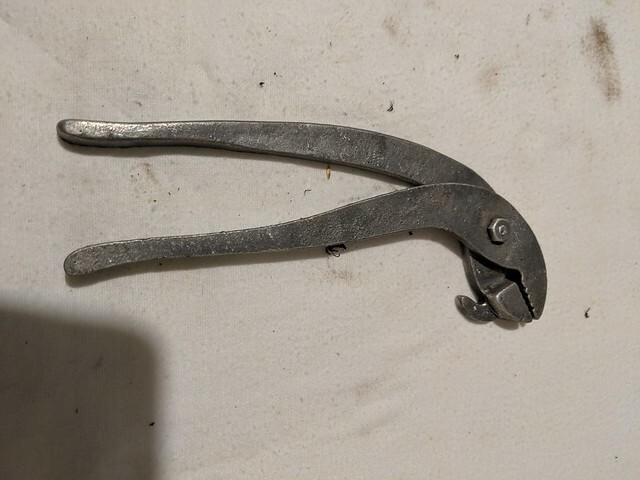 What's-It Forum / Re: Is this a tire iron? Thanks for the comments. It's a keeper. I don't expect to use it on split or solid rings but I bet it will come in handy around the shop as a pry bar. Success is not getting what you want, it's enjoying what you have. Catch 22, Was that a solid lock ring? I remember having a bar for solid rings and a different bar for split rings.... I think. One thing I am sure of is that I would rather wrestle a semi truck tire than work on a 16" Ford tire. It would be nice to see pics of your truck. It looks to me like your 1/2” drive ratchet was made in 1945 and your Ferret was made in 1940. I found a 1/2” drive one made in 1944 at a garage sale yesterday.